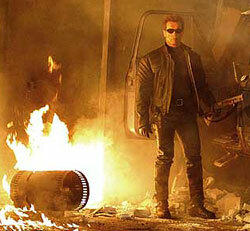 Lucas Grindley gets all ‘Terminator 2’ on predicting a bleak and disastrous worst-case scenario future for newspapers. In his nightmare scenario, the print editions falter, then down goes the AP, and then, perhaps a really bad person or organization is left to pick up the pieces and fill the void. “When newspapers die, there will be an immediate and large unmet demand for news. So what won’t get covered? That’s the immeasurable cost of all this. Failing financially now means failing the country later. I don’t need to remind this audience that, whether we like to hear it or not, much of the reason people pick up a newspaper is for the comics, classifieds, weather report, movie times, tv listings and even that big stack of Sunday inserts. So what can we offer on a printed page that just doesn’t work for the Web? How can we make newspapers absolutely essential again? Hell, if I really had the answer I’d make my billions and retire to the Caribbean. But some editors say the answer is running more perspective pieces than on the Web and less breaking news, as the Wall Street Journal has done with their redesign. That may be part of the solution, but the answer isn’t necessarily “better journalism” or a nicer design or more of the same kind of content only tweaked. I believe it’s introducing new kinds of important content that can only possibly work in a multi-page, easily flippable paper publication and that will become embedded in the social psyche, much as the weekend store ads have. Let’s start thinking hard-core about “what doesn’t work on the Web” and then do way more of that in the paper. Remember that in ‘Terminator 2,’ they managed to prevent Armageddon, even if the big save did come from some unlikely people. 7 Responses to "Predicting Armaggedon for newspapers"
Ouch. The “pessimistic” label really strikes me to the core. The hope with my post wasn’t to impart some great hopelessness, but rather to illustrate what’s at stake in all of this. We’ve got to start acting like the changes are all happening right now instead of using as a crutch the idea that newspapers couldn’t possibly go anywhere, no matter how badly a job we do. Be prepared. In the real world, you can’t send your robot back in time to fix things. Hmmm. On second thought, maybe we should forget about new business models and get to work on the robots . . . There is a great deal at stake — the very nature of our political system, as you had written. Had the world not fervently discussed such scenarios, we’d all have been under mushroom clouds years ago. You are absolutely right in outlining the worst-case scenario, and I thought it was well-written and thought out. I like to think newspapers will still be around, though they’ll be very different from what we see today. I believe they will not be destroyed, but rather, evolved. But we won’t ever get there if we just grow news Web sites without thinking about how the newspaper can also fundamentally change for the better. It’s easier to enact grandiose changes on the Web because the “rules” haven’t been fully written and the investment required to change or create a feature is generally minimal in comparison to, say, changing a printed publication’s size. My whole point is that the brightest in our industry desperately need to think as innovatively about the printed product as we do about our news sites. And then, we might just avoid Armageddon. Lucas comments on the likes of Google and Yahoo owning papers in the future and their lack of journalistic experience, “they don’t care about journalism”. That may not be a bad thing. One of the impending problems visible now with newspapers is the trouble managing the ads and generating the proper revenue on their online editions. Google would only care for the traffic. The expertise of AdSense or any other program might make for a journalist that is less troubled by circulation concerns, paper editions become a trophy and tradition supported by enormous bankrolls that don’t need them to create a real profit. Also, ads in those additions might be better focused and actually increase their profit. Newspapers might begin to use the blogosphere much in the same way that they use the AP or Reuters. Another thing is that papers tend to hold onto their libraries and lock them up for a price to search. That is missed ad revenue for the online editions. Imagine the bank of restaurant reviews, music reviews and other area info that only they have from qualified and trusted authors. Open them up to the google bots and drive more traffic even for a page that is years old. (not my idea, I read a complaint about that recently, sorry can’t cite it though, lost link). Besides, Google and Yahoo are already beaten up and sensitive about censorship and influence after dealing with China and such.